Experience your own raft trip, the company outing with teambuilding effect. 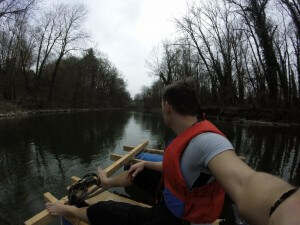 … At first, you can paddle comfortably across the river. Every now and then, a small water battle arises, and there are plenty of sayings knocked. 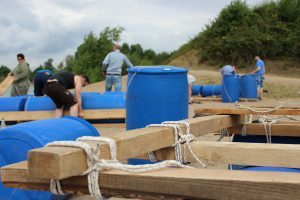 So it does not take long until the honor of one or the other competitor is injured – a race must come: “On your marks, get set, go!” The rafts are rapidly gaining momentum. The raft of Team Yellow is good in the race. But suddenly a dull thump sounds: “Wumm!” And the raft has come on the single stone far and wide. The yellow team flag tilts into the water; The raft slowly dissolves into its components. First it comes to panic, then blame. After all, the whole team is in the water up to their stomach. Now it is time to pull yourself together: Together, the barrels are pulled out of the reeds and the ropes are fished out of the river. Then everything is knotted again. After a while, the raft floats again. The paddles move in time and the team flag is clearly visible in the middle of the raft. In the meantime, the cozy part of the teambuilder has already begun with colleagues ashore. But the silence is increasingly interrupted by rhythmic calls. Curious, some colleagues run to the shore, and soon a considerable bow wave floods the small pebble beach – pebbles crunch and are pushed by the incoming raft to the side. A jump in the gravel, one last effort, and Team Yellow has secured his raft on the shore. The evening sun bathes the surroundings in a wonderful, golden light, and over the raft of Team Yellow proudly blows the team flag. Those who participated in the rafting will talk about it for a long time. What an extraordinary teambuilding event! First build a raft and then conquer the river together – something you must have experienced. An unforgettable company outing, a great time to celebrate!